In Release 12.2, Web and Forms services are provided by Oracle Application Server and Oracle Fusion Middleware. They are no longer servers in the sense of being a single process, as was the case in previous releases. Oracle E-Business Suite Release 12.2 uses two application tier ORACLE_HOMEs. • An OracleAS 10.1.2 ORACLE_HOME that was used in previous 12.x releases. ORACLE_HOME that was used in previous releases. The use of these two ORACLE_HOMEs enables Oracle E-Business Suite to take advantage of the latest Oracle technologies. • The Oracle E-Business Suite modules (packaged in the file formsapp.ear) are deployed out of the OracleAS 10.1.2 ORACLE_HOME, and the frmweb executable is also invoked out of this ORACLE_HOME. 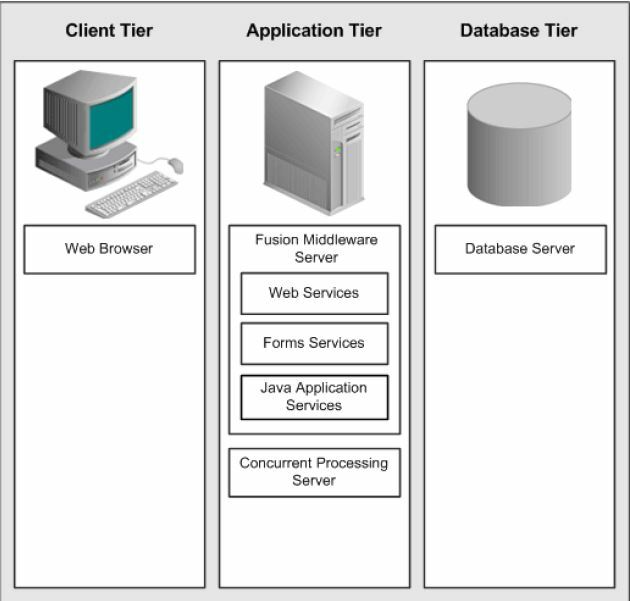 • All major services are started out of the Fusion Middleware ORACLE_HOME. • The Oracle Application Server 10.1.2 ORACLE_HOME (sometimes referred to as the Tools, C, or Developer ORACLE_HOME) replaces the 8.0.6 ORACLE_HOME provided by Oracle9i Application Server 1.0.2.2.2 in Release 11i. 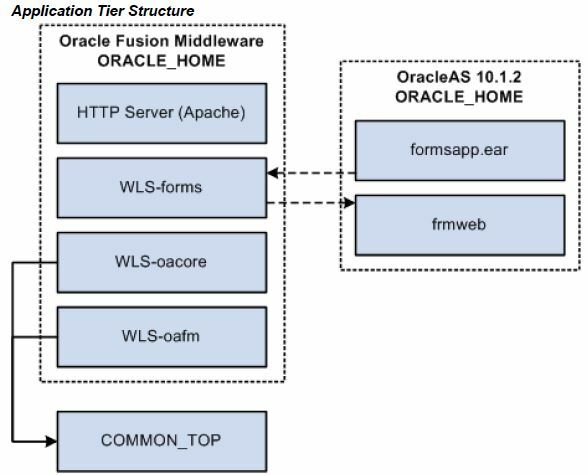 • The FMW ORACLE_HOME (sometimes referred to as the Web or Java ORACLE_HOME) replaces the OracleAS 10.1.3.-based ORACLE_HOME used in Oracle E-Business Suite 12.x releases prior to 12.2. The Web listener component of the Oracle HTTP server accepts incoming HTTP requests (for particular URLs) from client browsers, and routes the requests to WLS. Like other 12.x releases, Oracle E-Business Suite Release 12.2 uses the concept of a top-level directory for an Oracle E-Business Suite instance. This directory is referred to as the Instance Home, and denoted by the environment variable $INST_TOP. Using an Instance Home provides the ability to share application and technology stack code among multiple instances, for example a development instance and a test instance. Most configuration files created by AutoConfig are stored under the Instance Home. Other benefits of the Instance Home include support for read-only file systems. APPL_TOP, OracleAS 10.1.2 ORACLE_HOME, and OracleAS 10.1.3 ORACLE_HOME. 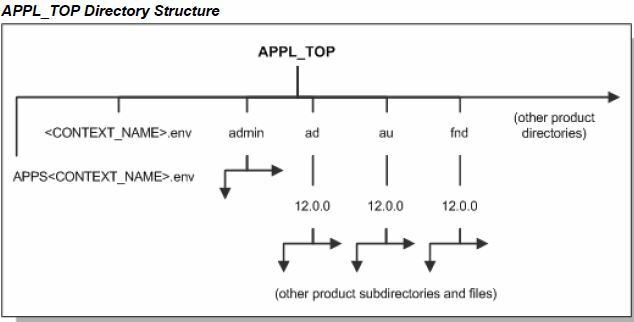 In Release 12.2, the APPL_TOP and FMW_Home contain some configuration files modified by AutoConfig. Only the OracleAS 10.1.2 ORACLE_HOME configuration files are located under $INST_TOP, and so can be made read-only. The HTTP and Oracle WebLogic Server configuration files are not stored under the $INST_TOP. The Oracle Fusion Middleware top-level directory and its subdirectories (described later) are completely new in Oracle E-Business Suite Release 12.2, as this technology was not used in previous releases. The EBSapps directory is another key high-level directory in Oracle E-Business Suite Release 12.2. Typically, it will be located in a path such as /u01/R122_EBS/fs1, at the same level as the inst directory. 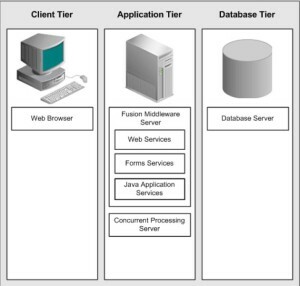 The Oracle Fusion Middleware (FMW) directory is another key high-level directory. It is completely new in Oracle E-Business Suite Release 12.2, as this technology was not used in previous releases. • EBS_Domain: The Oracle WebLogic Server domain used to deploy Oracle E-Business Suite. All the domain-specific configuration and log files are located here. Each node in a WLS domain has a Node Manager, which can be started and stopped using the $ADMIN_SCRIPTS_HOME/adnodemgrctl.sh script. •wlserver_10.3: Contains all the binaries and libraries required to support Oracle Weblogic Server. • oracle_common: Contains all the Java Required Files (JRFs) needed by Oracle E-Business Suite. • webtier: Contains the HTTP server instance used by EBS. All the HTTP-specific cpnfiguration and log files are located here. • Oracle_EBS-app1: Oracle E-Business Suite is deployed as an Oracle Home under FMW. This directory contains all the configuration files related to oacore, forms, oafm, and forms-c4ws. 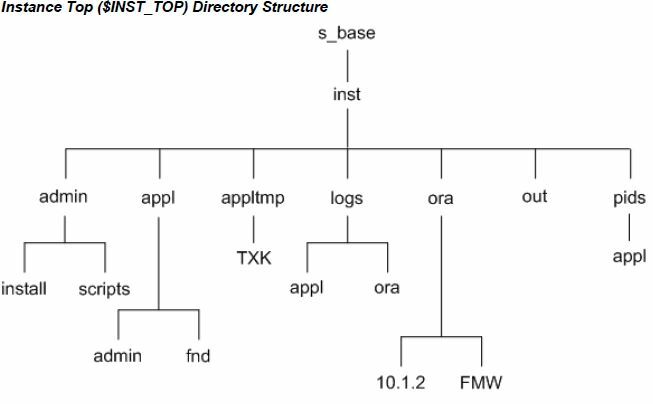 The EBSapps/comn (COMMON_TOP) directory contains files used by many different Oracle E-Business Suite products, and which may also be used with third-party products. The admin directory, under the COMMON_TOP directory, is the default location for the concurrent manager log and output directories. When the concurrent managers run Oracle E-Business Suite reports, they write the log files and temporary files to the log subdirectory of the admin directory, and the output files to the out subdirectory of the admin directory. Rapid Install places all Oracle E-Business Suite class files in the COMMON_TOP/java/classes directory, pointed to by the $JAVA_TOP environment variable. 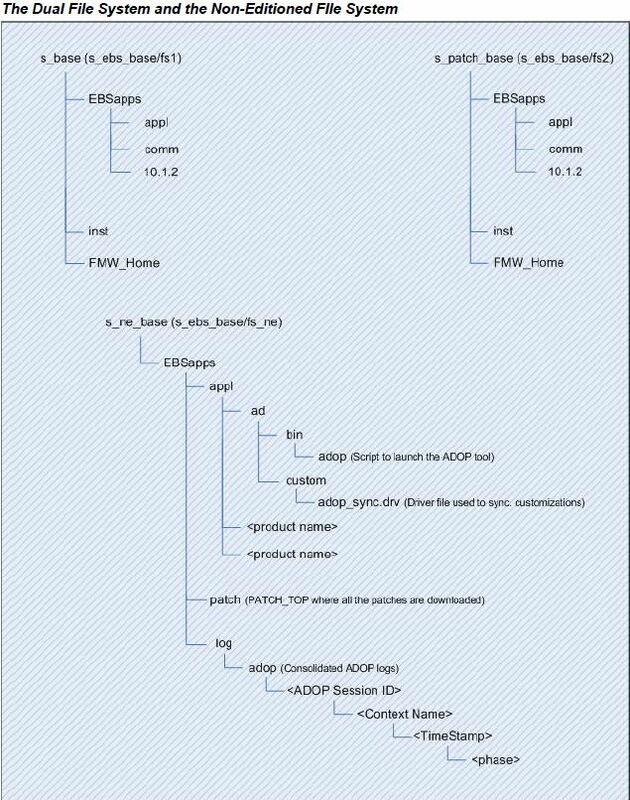 Zip and jar files are installed in the $COMMON_TOP/java/lib directory, pointed to by the $AF_JLIB environment variable. The top-level Java directory, $COMMON_TOP/java, is pointed to by the $JAVA_BASE environment variable. The util directory contains additional utilities that ship with Oracle E-Business Suite. These include the Java Runtime Environment (JRE) and Java Development Kit (JDK). 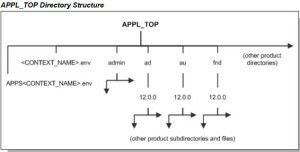 Many Oracle E-Business Suite files are stored in the EBSapps/appl directory, which is generally known as the APPL_TOP. • The core technology files and directories. • The product files and directories (for all products). • The main Oracle E-Business Suite environment file, called <CONTEXT_NAME>.env on UNIX, and <CONTEXT_NAME>.cmd on Windows. • The consolidated environment file, called APPS<CONTEXT_NAME>.env on UNIX, and APPS<CONTEXT_NAME>.cmd on Windows. 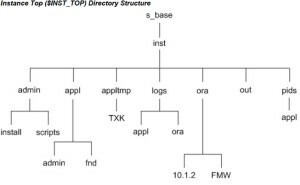 Rapid Install creates a directory tree for every Oracle E-Business Suite product in this APPL_TOP directory, whether licensed or not. Regardless of registration status, all Oracle E-Business Suite products are installed in the database and the file system. Oracle E-Business Suite Release 12.2 uses a dual file system . At a given time, one file system (designated ‘run’) is part of the running system, while the other (designated ‘patch’) is either having patches applied or standing by in readiness for patch application. The two file systems are often referred to as fs1 and fs2. It is important to distinguish between the file system (fs1 or fs2) ) itself and its current role, which alternates between ‘patch’ and ‘run’ with every patching cycle. As well as fs1 and fs2, there needs to be a non-editioned file system (fs_ne), which is used to store files containing data that is needed across all file systems. The non-editioned file system is designed to store files which will never be changed by run and patch file system life cycles.The most notable examples of this are transactional data and certain log files. fs1 (production file system) – Used by the current users of the system. 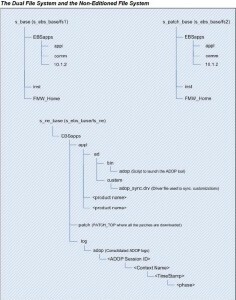 fs2 (Copy of production file system) – Used by the patching tools. fs_ne (Non-editioned file system) – Stores files containing data that is needed across all file systems (for example, data import and export files, report output files, and log files). Inst (INST_TOP) – Oracle E-Business Suite Release 12 Instance Home, contains all the config files, log files, SSL certificates etc. All three file systems serve a single database. The file system that is currently being used by the running application is never patched: all patches are applied to the file system that is not currently in use. Can we rollback the patches during ADOP phases ? If i want to apply patch...what environment to apply this patch? Run system or patch system?